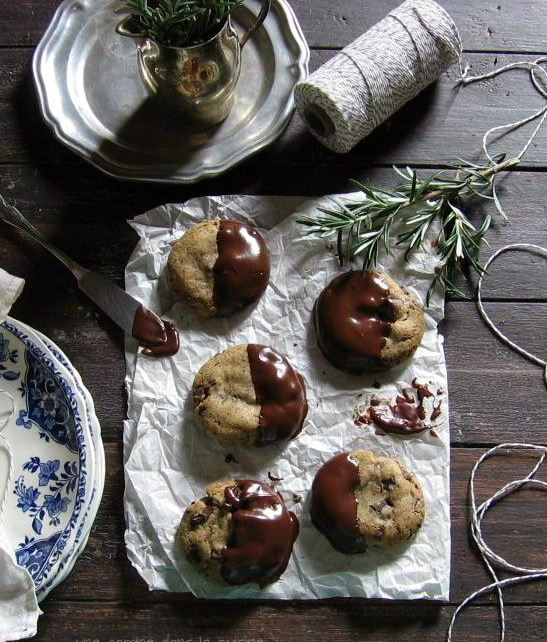 If you don't have a bag of outdated dark chocolate raspberry swirl chocolate chips, these soft, chewy cookies are the perfect blank canvas for just about anything you want to add. The classic mint version was spectacular, but feel free to throw in anything. I think dark chocolate and toffee would be a great combination! In a larger bowl, beat the butter and sugars together on medium speed until light and fluffy (about 2-3 minutes). On low speed, slowly add the beaten egg and almond extract. Beat to combine, scrape down the sides of the bowl. Preheat the oven to 375F. Line baking sheets with parchment paper. Scoop out well rounded tablespoonfuls of the dough and roll them into balls. Leave about 2 inches between each ball. Bake for 8-9 minutes. If you prefer crispier cookies increase the baking time by 1-2 minutes. Allow the cookies to cool on the baking sheet for about 5minutes before removing. 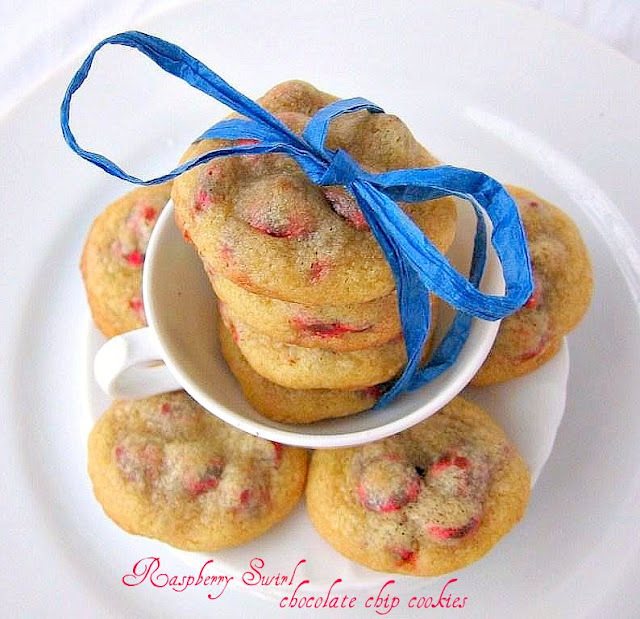 I don't have a bag of raspberry swirl chocolate chips, but these look delicious! They are very pretty too (as usual;). Hope you had a relaxing day yesterday too, Valerie. I have a feeling that you're going to love that cranberry cake. Mmm..I love raspberries! 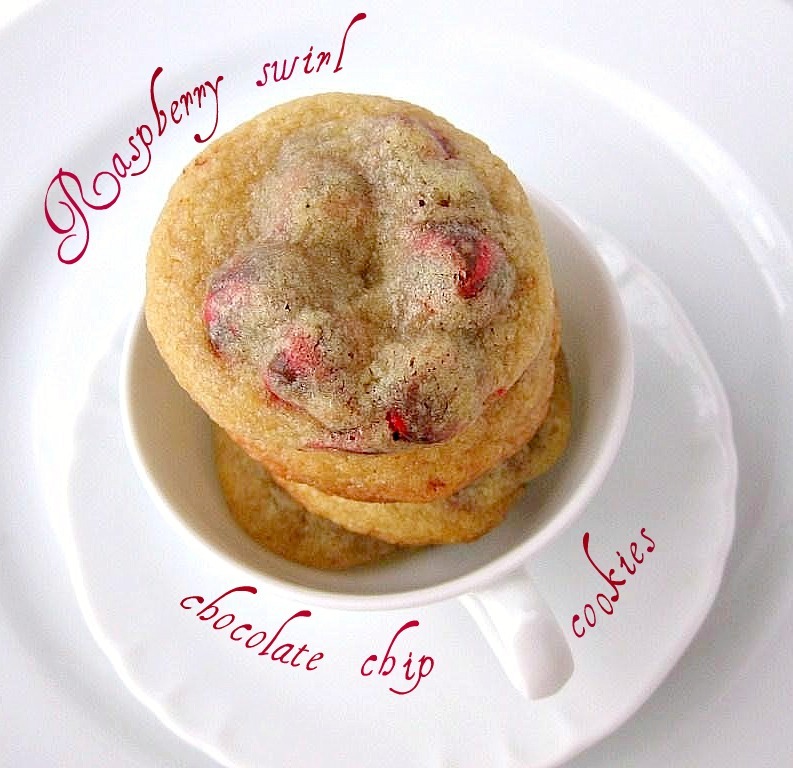 I thought there were actual raspberries in the cookies at first, and I wondered how you'd managed to keep them from collapsing. Now I realize it's the (outdated) chips that did it! They look yummy--those cookies look nice and chewy. Such beautiful photos too--looks like you and your camera are getting on well. p.s. I'm having some odd commenting issue, so pardon me if this shows up 12 times! 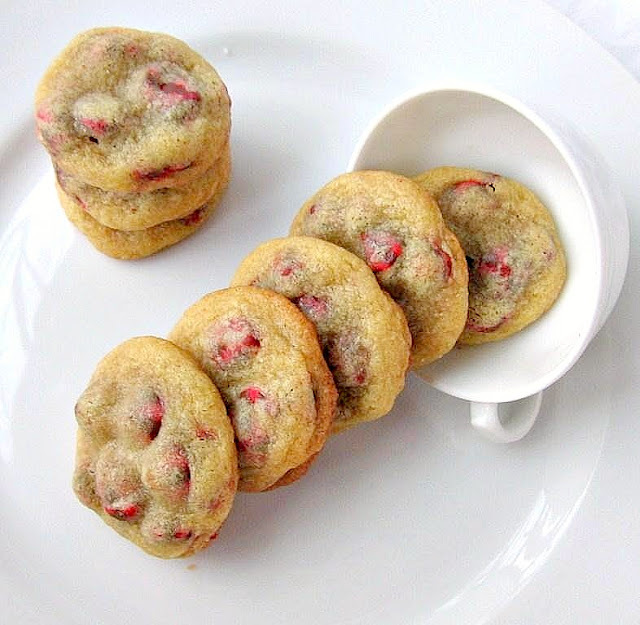 These cookies look so amazing, I think I'll have to go on a hunt for raspberry swirl chocolate chips! (Sometimes I get obsessed about these things.) Failing that, I like your suggestion about using toffee. And of course all of this has to wait until I get my oven back! These look SO good! Ive not had cookies like this before! Wow rasberry swirl chocolate chip cookies look and sound delicious! Where can you find the Raspberry Swirl Chips?? i haven't seen them before... The cookies sound AMAZING! Hey Valerie, I'm just here to see if you've posted anything. Even though you didn't I just wanted to tell you that I dreamed about you last night. Nothing freaky and I can't remember the dream-I just thought it was funny/weird (smile).